A Toast to 155 Years! Happy Birthday to Paderewski! You may or may not know the story behind the name of our Paderewski Vineyard. If you do not, the word Paderewski scribbled on our bottles probably raises a few questions and looks like one of those words you wouldn’t dare try to say out loud for fear of sounding silly (by the way, it is pronounced p ae – d uh – r eh f – s k ee; that soft “f” is the key to sounding like you know what you’re talking about). Yes, Paderewski is a mouth-full, but our first vineyard’s namesake is a very important man in history and a key player in our own Epoch story. The short story? Ignacy Jan Paderewski was a world-renowned pianist and a former Prime Minister of Poland who found residence in Paso Robles, of all places, during the early 1900’s. Want the long story on Paderewski? It’s a really good one! Check out Jenna Rovenstine’s blog on this guy….y’all, he is really impressive! We are blessed to now own 600 of the 2,000 acres Paderewski once called home in Paso Robles, hence the reason we chose that long, crazy looking name for our first vineyard at Epoch. Ü Some might consider us Paderewski fanatics, but we wear that badge proudly at Epoch and take our job of preserving his legacy very seriously. 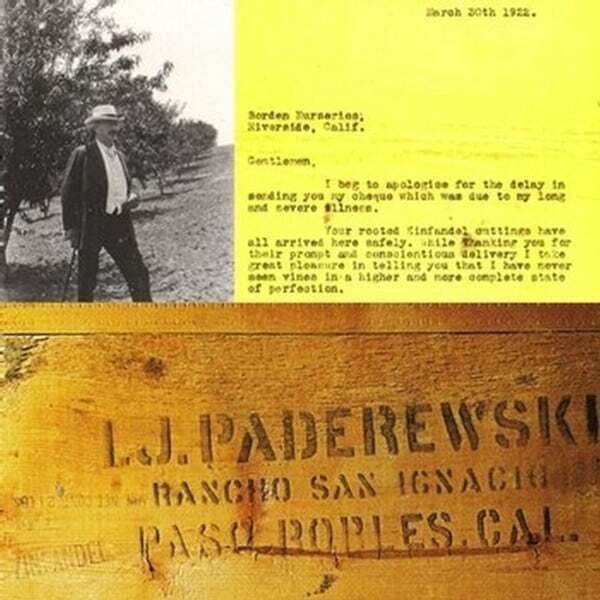 Upon purchasing Paderewski Vineyard in 2004, we decided to pay homage to this Polish Statesman (and Winemaker) by planting Zinfandel, just as Paderewski did on this very site a century before us (see his letter below as well as the photo of his original grape boxes*). In honor of our beloved Paderewski turning 155 today, we are offering 2012 Zinfandel on our online storefront during the month of November (unless of course, we sell out before month-end)! We can think of no better way to wish Paddy a big HAPPY BIRTHDAY than by raising a glass of Epoch Zin in his honor this month! If you have never tried our Zinfandel before, we like to think of ours as standing out from the crowd. The style and quality spectrum for Zin can by quite diverse, but when done right, “America’s Grape” can be classy and worthy of cellar age, while still maintaining its token American bold and bodacious brambliness. We like to think our Zin would make Paderewski proud. So this month, we dare you to put your preconceived notions aside and give our Zinfandel a try in honor of Paderewski. Ü Happy birthday, big guy!! !